Metal Tiger plc (LON:MTR), the London Stock Exchange AIM listed investor in strategic natural resource opportunities, today provided an update on the substantial Ore Reserve upgrade for the T3 Copper Project (“T3”), held 100% by MOD Resources Limited (“MOD”), in the Kalahari Copper Belt, Botswana following MOD’s announcement earlier today. 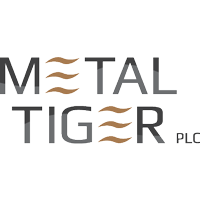 Metal Tiger currently holds approximately 10.48% of the issued share capital of MOD. · Open pit mine design in six stages, with 3Mtpa conventional processing plant, provides a life of mine (“LOM”) over 11 years, with a LOM stripping ratio of 5.7:1. · T3 Feasibility Study (“FS”) on track for completion at end of March 2019. “We are very pleased to report the significant JORC Compliant Ore Reserve upgrade for MOD’s proposed T3 Open Pit mine project in Botswana. Draft FS financial modelling, currently being finalised, shows the project is economically viable under current assumptions and within a range of reasonable sensitivities to the assumptions. In the opinion of the competent persons (“CPs”), cost assumptions and modifying factors applied in the process of estimating Ore Reserves are reasonable. The proposed T3 open pit mine site is located approximately 80km north-east of Ghanzi and 200km south-west of Maun, Botswana. The proposed T3 mine and associated mining infrastructure lies within freehold farm land within PL190/2008. MOD’s in-country operating company, Tshukudu Metals Botswana (Pty) Ltd has entered into a binding agreement to acquire the 25km2 area of the farm, which will be the subject of a mining licence application expected in mid-2019. The Mineral Resource has been defined along an approximately 1.5km long strike length and the copper and silver sulphide mineralisation occur in veins and disseminations within host rocks that include mudstone, siltstone, sandstone and marl units considered part of the D’Kar Formation. The proposed mine site layout includes a single pit with haul roads connected to a single waste rock dump, mineralised waste dump, low grade stockpile and a run of mine (“ROM”) pad. There are surface water diversion channels, surface dewatering bores, light and heavy vehicle workshop facilities, explosives storage, a planned 3.0Mtpa processing plant, supply facilities, technical services facilities, and administration facilities. The Botswana Government has awarded contracts for the extension of a 220kV grid power transmission line along the A3 highway that joins Toteng and Ghanzi, approximately 14km by road from the T3 Copper Project, scheduled to be available during the first quarter of 2020. MOD has maintained regular communication with the Botswana Power Corporation (“BPC”) to confirm the scheduled availability of power. MOD plan to utilise grid power as the primary power supply for the T3 Copper Project. Tailings from the roughing and cleaning stages will be pumped to the engineered, HDPE lined, tailing storage facility (“TSF”) located south of the proposed mine. The TSF is designed to store approximately 34.4Mt of conventional thickened tailing. Net present value (“NPV”) and free cashflow analysis of the Ore Reserve is based on assumed commodity prices and other current key assumptions, which indicates the project is financially viable and capable of generating strong returns.